Drawing from personal experience, Joe Theismann knows how to deal with the Challenge of Change. On November 18, 1985, he was on top of his game -- a two-time Pro Bowl player and the most productive quarterback in the history of the Washington Redskins. Later that evening, he found himself in a hospital bed with a compound fracture to his leg, shattering both his career and his boyhood dream. At age thirty-five, he was faced with starting over his personal life and professional career. In this stirring presentation, individuals and organizations learn how to tackle change by keeping a positive mental outlook and committing to a vision that guides you to the top. This dynamic presentation outlines the game plan that brought Joe Theismann success both on and off the football field. Former NFL MVP quarterback and Super Bowl champion, he reveals his Game Plan for Success by drawing parallels between winning in football and in business. Joe Theismann focuses on how to succeed under pressure -- when it's "4th and 1" -- and how to adapt quickly to unexpected situations -- when you're faced with a "blitz" instead of a "zone." He urges individuals and organizations to set goals and correct errors each step of the way, an approach that builds momentum, which, once on your side, would be hard for even the best "defense" to stop! In his charismatic and entertaining style, Joe Theismann draws parallels between his successful career as an NFL quarterback and YOU -- the executive, manager, salesperson, group, or individual - with the goal of Managing to Win! He knows and understands that good management and effective leadership is not a game of follow the leader: It is about PEOPLE -- listening to them... trusting them... and motivating individuals to take ownership of team goals. By example, Joe Theismann shows that an effective leader cares about and trusts subordinates and demonstrates it by empowering individuals to take risks in order to perform above levels that have become comfortable. Losing his successful football career at 35 to a serious injury, Joe Theismann learned firsthand how to think, analyze and reinvent in the face of adversity and change. 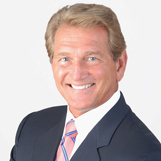 Joe Theismann is an entrepreneur and the former star quarterback for the Washington Redskins. He spent the last two decades working for ESPN on their NFL broadcast and the NFL Network. The former Washington Redskins quarterback joined ESPN in April 1988, reuniting with play-by-play voice, Mike Patrick. Theismann joined ESPN after spending two seasons as an NFL analyst for CBS Sports. A 12-year NFL veteran, Theismann played in 163 consecutive games from 1974-1985 and holds Redskins’ records for passing yardage (25,206), completions (2.044) and attempts (3,602). A two- time Pro Bowl selection, Theismann led Washington to a 27-17 victory over the Miami Dolphins in Super Bowl XVII. Theismann was selected the NFL’s Man of the Year in 1982 for his community service and dedication to the health and welfare of children. He won the league’s 1983 Most Valuable Player Award for leading the Redskins to an NFL-recorded 541 points and a second consecutive Super Bowl appearance. His career ended abruptly in 1985 after sustaining a broken leg during a game against the New York Giants on national television. Theismann graduated in 1971 from the University of Notre Dame where he received All-America honors and led the Fighting Irish to consecutive Cotton Bowls and was runner-up to Jim Plunkett in the Heisman Trophy balloting. In 2003, Theismann was inducted into the College Football Hall of Fame. Theismann began his career in 1971 with the Toronto Argonauts of the Canadian Football League, after being drafted by the Miami Dolphins and Major League Baseball’s Minnesota Twins. Theismann, a much sought after motivational speaker, also oversees a popular Washington, DC restaurant that bears his name. He is also the author of The Complete Idiots Guide to Understanding Football Like a Pro. Recently, Theismann was named the recipient of the 2013 Walter Camp Football Foundation “Distinguished American” Award.